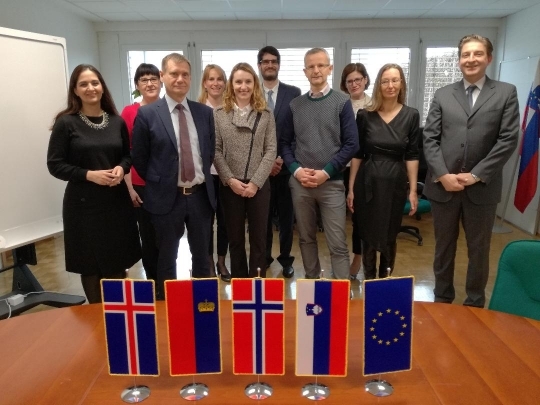 The first meeting of the Joint Committee for Bilateral Fund under the EEA and Norway Grants 2014–2021 took place in Ljubljana on Wednesday, 10 April 2019. Members of the Committee devoted most of their time to reviewing the role and responsibilities of the Committee and the plan of envisaged bilateral activities. They identified four areas of bilateral cooperation, i.e. equal opportunities, especially in diplomacy, awareness-raising of climate change mitigation measures among policy-makers and assistance to developing countries. H. E. Olav Berstad, the Ambassador of the Kingdom of Norway, representatives of the Ministry of Foreign Affairs of the Republic of Slovenia, the Financial Mechanism Office in Brussels and National Focal Point set the direction for future successful bilateral cooperation between the Donor States and Slovenia at the first joint meeting.